27 Years in the business, over 7000 pool remodels, driveways, patios, and pool decks projects completed. 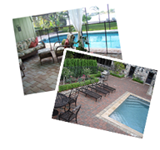 Welcome to All Seal Exteriors - Your #1 Choice in Pool Remodeling, Pavers and Stamped Concrete. Contact us for a free consultation! We are licensed, insured and bonded. Take a look at the kind of work we can perform at your commercial building or residence. Financing is available for residential projects. Please contact us for details. ASE has 25+ years of experience, working in South Florida on the tri-county area of Dade, Broward and Palm Beach counties. 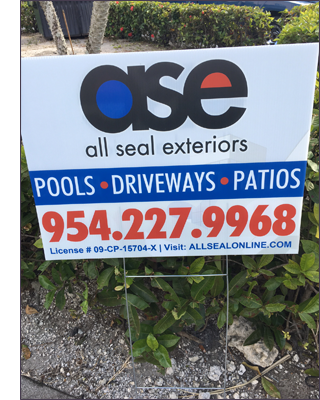 All Seal Exteriors has a track record of over 7000 driveways, patios and pool decks completed, with thousands of satisfied customers. Installations, Repairs, & Resurfacing for Driveways, Patios, Pool Decks, and more. We are South Florida's #1 concrete flooring contractor. We do over 10 projects a week, and more that 500 projects a year. We stand out from our competitors for our experience, value and selection of services. After all, we are the #1 Choice in Stamped Concrete and Pavers. Our driveway, patio and pool deck services are available throughout South Florida including but not limited to Pompano Beach, Fort Lauderdale, Parkland, Deerfield Beach, Coconut Creek, Coral Springs, Margate, Tamarac, Hollywood, Pembroke Pines, Weston, Boca Raton, Delray Beach, Boynton Beach, Sea Ranch Lakes, Cooper City, Davie, Lauderdale-by-the-Sea, Lighthouse Point, Oakland Park, Wilton Manors, Plantation, Sunrise, Southwest Ranches, Miramar, Hallandale, North Lauderdale, Lake Worth, Lantana, Palm Beach Gardens, Royal Palm Beach, Greenacres, Highland Beach, Riviera Beach, West Palm Beach, Wellington, Jupiter and Gulfstream. Discounts are available for Senior Citizens, Civil Service and Military Personnel. By Hiring Us, You Will Save Time and Money! 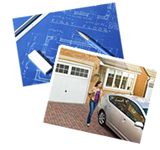 Request a Free Estimate Now! ASE Pools offers South Florida residents a wide variety of Pool Remodeling services. Nothing compliments your home’s architecture and grounds like the classic elegance of brick. Stamped concrete is designed to resemble brick, slate, flagstone, stone, tile and even wood. Travertine Pavers is durable, providing a stronger than poured concrete, tile or asphalt product. Eurotile is an excellent choice for use in residential commercial applications! Cleaning and sealing your concrete & pavers periodically are key components. ASE offers Restoration services so you don’t have to redo everything. Transform any concrete surface quickly and economically with Spray Deck. The cities where we perform our work include, but are not limited to Pompano Beach, Fort Lauderdale, Parkland, Deerfield Beach, Coconut Creek, Coral Springs, Margate, Tamarac, Hollywood, Pembroke Pines, Weston, Boca Raton, Delray Beach, Boynton Beach, Sea Ranch Lakes, Cooper City, Davie, Lauderdale-by-the-Sea, Lighthouse Point, Oakland Park, Wilton Manors, Plantation, Sunrise, Southwest Ranches, Miramar, Hallandale, North Lauderdale, Lake Worth, Lantana, Palm Beach Gardens, Royal Palm Beach, Greenacres, Highland Beach, Riviera Beach, West Palm Beach, Wellington, Jupiter and Gulfstream.